Each family should decide which parent is to become the practice parent. This parent will learn the basic skills of the instrument and coach the student at home. The practice parent is expected to be present at each lesson and group class. They should come with a notebook ready to take notes. The parent should be careful not to interrupt the teacher, but should also feel comfortable to ask questions and give feedback at the end of the lesson. The parent should strive to always be encouraging and positive, and they should never compare their child to anyone else’s. Each child will learn at their own rate, and the goal of the parent is to nurture their child through music. Parents should also play their Suzuki CD regularly, if not daily. One of the most important and most difficult goals for each parent is to approach practicing with a joyful heart. Even if it requires pretending, the more excited about this new endeavor you are, the more successful your child will be. Please refrain from using any cell phones or blackberry devices during your child’s lessons and group classes. The attention should be on the child and the music making. Students are expected to attend all private lessons and group classes. Each student is required to perform on at least one solo recital and the group concert each semester. Failure to meet this requirement will result in probationary status. 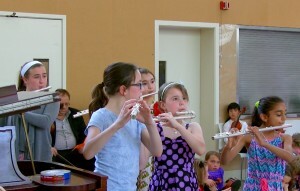 Learning to perform is a major element of music making. There is one free cancellation built into the schedule for the teacher to use at his/her discretion. In other words, there are 16 weeks in each semester, but parents have only paid for 15. This cancellation is for the teacher to use as needed. If a parent cancels a lesson, the lesson becomes forfeit. Teachers are not required to do any make ups for any student. Some teachers may opt to offer a make up lesson for an extreme situation. Please do not assume this is the norm or should be expected. Parents should strive to arrive a few minutes before each lesson. This way the child will not feel rushed or harried before going into their lesson. We understand that there are many issues that a Suzuki parent will need and want to discuss with their teachers. All of our teachers do their best to reserve a few minutes at the end of each lesson for parent questions. This time is most appropriate for music related issues and not appropriate for scheduling, financial or behavioral issues. It would be better to discuss these issues without the child present. In your folder, you will find your teacher’s preferred method of communication. Each teacher tries to make themselves as available as their schedule allows. You can also contact the Director, as she is almost always available by phone or email. Heather is specifically setting aside phone hours this year on Fridays from 10 am – 2 pm. It is not appropriate to take time from the next student’s lesson or group class to address any issue. We Suzuki teachers always want what is best for each child. Sometimes, this means they may need a new teacher. While this does not happen very often. we want parents to feel very comfortable bringing this up with their teacher. This is the first step every parent should make when they feel the need for a transition. Speaking with your teacher first demonstrates proper etiquette and shows respect for your teacher. It is not uncommon to need a new teacher after many years with the same teacher and shouldn’t be a subject to shy away from. We always want to maintain open lines of communication between parent and teacher. Please feel free to talk about this issue with your teacher if you have concerns. It may be a new tactic or approach is needed or it may be time to switch teachers. In the case of inclement weather, we will usually follow the Greenwich Public School closings. There will always be a posting on our web site if there are any changes in the schedule. The last lesson of each term is designated as a conference session for the parent and teacher without the student. This is the time when the parent and teacher can both voice concerns and talk about long-term goals for the student. At the end of this session they will fill out a progress report. The teacher and parent will discuss if the child will be placed on a probational status. This will only occur if there is very little home practice being done or if we sense a completely negative atmosphere around the music making. If the student is put on a probational status for two semesters in a row, we reserve the right to dismiss that student.